After losing her husband and daughter in a plane crash, Boston social worker Jennifer Barrett is rebuilding her life. Finding solace in her work, Jennifer helps young client Mark Powell find work at the seniors’ residence where her father lives. After learning Mark hasn’t seen his father, an internationally-known broadcast journalist, in over four years, she can’t understand how a father could abandon his only son to chase war stories. As new family bonds form, all discover the power of friendship and love to overcome loss so they can face life with renewed hope. Mary lives and breathes writing and editing. When not working as a writer/editor in her day job, she’s editing novels and manuscripts or working on one of her novels. 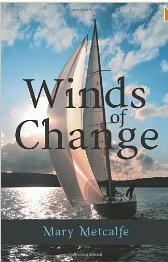 With Winds of Change as her debut in women’s fiction, New Beginnings will follow this fall with a strong suspense angle. Road to Tomorrow comes up next and continues her small-town series featuring a cast of warm and not-so-warm characters. *Promotional materials provided by author and Pump Up Your Book Tours.